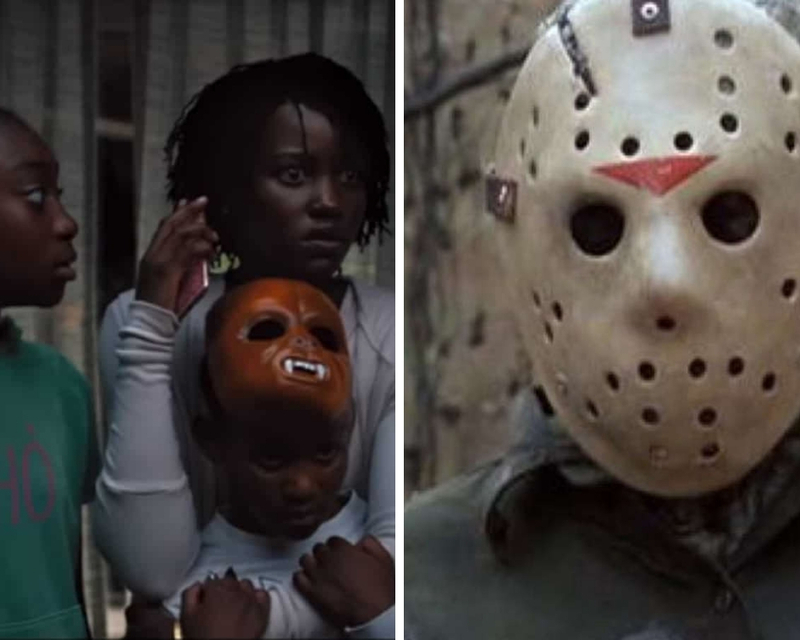 Is Jordan Peele’s “Us” Making a “Friday the 13th” reference? Last week in my review of Us, I speculated Jordan Peele’s new horror movie was making a Friday the 13th reference through one of its characters. It’s been nearly a week since then, the film has made nearly six times its budget back at the box office since its release, and people are still finding reasons to talk about this film. So I thought I’d throw my hat into the ring and further explain my own theory about the film, or to be more specific my theory regarding one specific character. That being said, I’m going to be going in-depth with this film, so if you haven’t seen Us yet, THIS IS YOUR SPOILER WARNING! STOP HERE IF YOU HAVEN’T SEEN THE FILM YET AD GO SEE IT BEFORE CONTINUING!! Still here? Good. Let’s begin. 1. 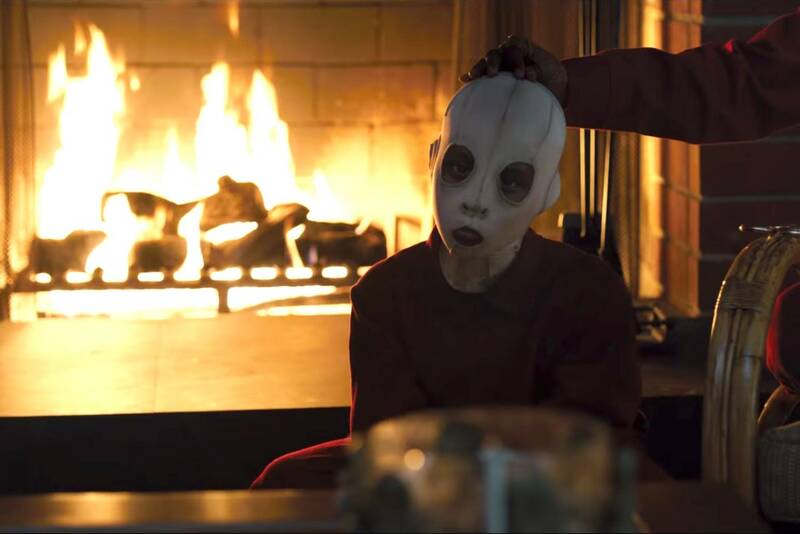 The character’s name is Jason, and he wears a mask throughout the film. These are small details, but they’re what turned me onto this. Jason Wilson wears a Chewbacca mask throughout the film, something never really explained beyond a statement by his sister Zora that he’s socially awkward. In the Friday the 13th films, Jason is famous for wearing a mask, most notably the iconic hockey mask. Additionally, both Jasons have two-syllable surnames, with the first letters of each surname right next to each other in the English alphabet. Both Jason Wilson and Jason Voorhees wear masks and are named Jason. Is that a coincidence? Okay, but that’s just a tiny detail. Is there anything else to back it up? Why yes, of course. 2. Their lives are forever changed around water. This is another small detail, but it’s also important. Jason Voorhees “drowned” in Crystal Lake, and afterwards hunted and killed around that lake. It was a turning point in his life, so to speak. In Us, Jason Wilson first meets the Tethered version of his family at his family’s vacation home, which is right on a lake. Later, his family travels to the Santa Cruz beach, where Jason kills his Tethered and is kidnapped by his mother’s double. Both of these events have a profound effect on Jason, psychologically scarring him, and will probably affect his life growing up. Just like Jason Voorhees when he drowned and when his mother was killed. 3. He and his Tethered. Both Jason and his Tethered, Pluto, share aspects of Jason Voorhees’s appearance and personality. Pluto is physically scarred, which is why he wears his mask. Jason W. is socially awkward, which may play into why he wears his mask. In the Friday the 13th films, Jason Voorhees is said to have been born with a condition that deformed his face, and made his interactions with other children difficult to say the least. You can make a connection between his physical and social problems to Jason W’s social issues and Pluto’s physical appearance. 4. Pluto’s name. Pluto is the Roman god of the Underworld, and is one of the few beings who can come and go from that realm at will. Pluto from Us comes from an Underworld of his own. And even before Jason V became a supernatural being who could resurrect himself every few years, his relationship to death was tenuous at best, having died or appeared to have died twice before Tommy Jarvis actually gave him what appeared to be a permanent death in the fourth Friday the 13th film. 5. How the killer dies. In Friday the 13th Part IV, young Tommy Jarvis shaves his head to make himself appear like Jason V as a boy, allowing him to eventually strike a fatal blow to Jason V. In Us, Jason W uses his connection to Pluto to compel his doppelganger to walk into a burning car, killing him. 6. The mothers. This is the detail that really made me think I had something with this theory. Both Adelaide Wilson and her Tethered Red are especially close with their sons, as we see through their interactions with them. This connection is so deep that, after Pluto is killed, Red takes Jason W into her underworld instead of killing him in revenge. It’s as if she couldn’t bear to lose her son and would accept his above-world counterpart rather than lose him entirely. Adelaide then follows Red into the tunnels to fight her, kill her, and take back her son, who is scarred forever from this event. In addition, both women are not what they seem. “Adelaide” is revealed to have originally been a Tethered, and “Red” was from the surface world, motivated by revenge to destroy the above world she was taken from. When we first meet Pamela Voorhees in the original Friday the 13th film, we believe she’s an eleventh-hour Samaritan to the surviving counselor, only to be revealed as a crazed killer seeking revenge for her son–her world–who was taken from her. At the end of Us, Jason W seems to know his mother is a Tethered, and his reactions seem to indicate he’s going to be watching her from now on, even though he loves her. And in the second Friday the 13th film, Jason V is revealed to be alive, having become an adult and starting his own reign of murder and terror. Which begs the question, if he was alive all these years, why didn’t he find his mother? Why didn’t he let her know he was alive? Perhaps did he know his mother was unhinged and decided to stay away from her because he couldn’t trust her? Tell me Mr. Peele, did I stumble onto something? Ultimately, this may just be me looking too deeply into one aspect of a film and drawing an entire theory from it. I’ve been known to do that before. * And I may be shouting into the wind with this blog post. But even if I’m totally off-base and making connections that weren’t meant to be there, it’s amazing how much is there to back up my crazy theory. And there’s a theory that the anime movie My Neighbor Totoro is a secret retelling of a murder-suicide in the 1960s. It got popular enough that Studio Ghibli came out and denied the theory. ** Perhaps I can get enough people to believe in this theory to get a response from Jordan Peele. Anything’s possible. But what do you think? Think I’m onto something? Am I crazy? Did I miss something that supports or tears down my theory? Let’s discuss. And while you’re here, I’m still looking for advanced readers for my novel Rose. It’s the story of a young woman who starts turning into a plant creature (and that’s just the start of her problems). If you would like to get an advanced electronic copy, please send me an email at ramiungar@ramiungarthewriter.com. All I ask is that you consider posting a review with your thoughts on or after the release date. Thanks, and I look forward to hearing from you. *I kid you not, I once saw a ballet based on the Oz books, and came up with a whole time travel theory based on its ending scene. My mother said I was crazy. I say it’s the only way outside of a dream sequence the ballet makes sense, and this ballet didn’t treat Oz as a dreamland. **No kidding, that’s a thing. Here’s an article that looks into the theory. And Studio Ghibli did have to come out and say it’s bogus. Which is only slightly weirder than the theory about Spirited Away that Ghibli did confirm was legit. The more you know. I wasn’t able to catch Get Out when it was in theaters, and by the time I watched it on DVD, so much time had passed I didn’t feel like writing a post with my thought. To sum up said thoughts, I thought it was a creepy, atmospheric film that openly explored racial attitudes among Americans, though I felt the main character was less a fully realized character and more of a vehicle for the audience to experience the movie through. So when I heard about Us, I was very intrigued. And then I saw that first trailer. And I knew I had to see what Jordan Peele had cooked up this time. Today, my sister and I went for an early showing, eager to see what people were talking about. To say the least, the film was surreal. Like Peele was channeling Stephen King when he was writing The Dark Half and created a visual twist on the concept. And it works for the most part. Us follows Adelaide, played by Lupita Nyong’o, a mother and former ballerina who goes up with her husband Gabe, daughter Zora and son Jason to a vacation home that Adelaide stayed at as a kid in 1986, when she experienced a traumatic episode. That night though, they’re attacked by the Tethered, twisted, animalistic doppelgangers of themselves that seek to murder Adelaide and her family. Thus begins a trial for the family to not only survive, but to find out why this is happening to them. From the get-go, this is a strange and eerie film. It combines storytelling with atmosphere, music (seriously, the part music plays in this film cannot be underestimated), and action in order to create an intense experience. At some points we were so on edge, a woman sneezing a couple rows behind us caused twenty people to jump out of their seats! And that includes me and my sister. And the amount of symbolism in this film can’t be understated. A lot of details go into this film that are meant to make you examine the imagery and ideas being presented. From actual twins, symmetry and patterns in objects and pictures, the Bible phrase Jeremiah 11:11, rabbits,* and so much more. All to get you thinking on these themes of identity, duality, being an American, socioeconomics, creative expression, and so much more. I won’t go into what it all means–I’m sure there are bloggers and YouTubers who will do a better job of that than I could–but it will leave you thinking for hours after you leave the theater. I will take a moment just to say that I think the son character is one big reference to the Friday the 13th franchise. This is mainly because his name is Jason and he wears a mask throughout a good portion of the film for some reason, but there’s plenty in the film I could point to that backs that assertion up. I won’t because I don’t want to spoil anything. If there’s one thing I didn’t care for, it was the humor in film. Not that it was terrible, but after the main plot of the film kicks into gear, I found how much of it there was, most of it coming from family patriarch Gabe (played with plenty of love by Nyong’o’s Black Panther costar Winston Duke) distracting. Like, there’s this one scene where the family is discussing what to do in light of what they’ve experienced, and they make a series of Home Alone jokes! Takes you right out of the tense, creepy mood. Then again, this is from Jordan Peele, who’s still primarily known as a comedian. Humor should be expected. But at a certain point, I just would like it if was toned down a bit. That may just be my quirk, but it’s how I feel. 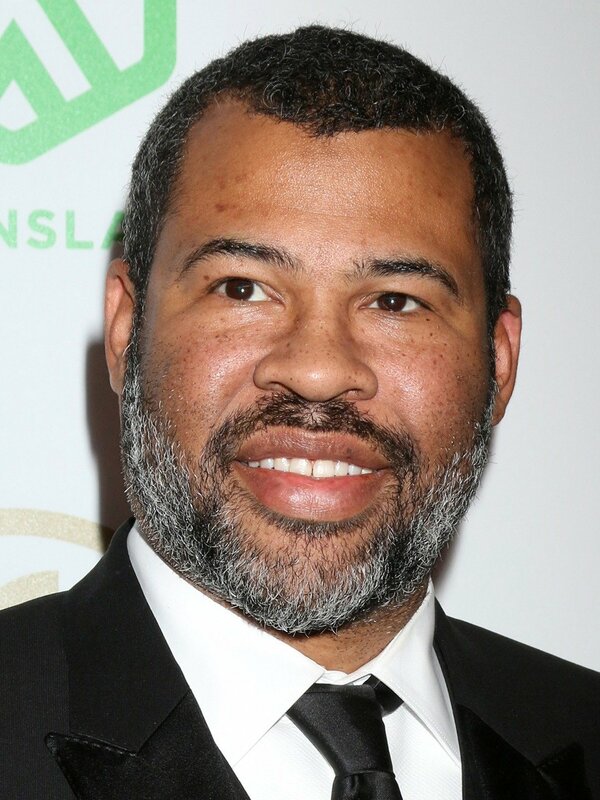 All in all though, Us is a true success for Peele. On a scale of 1 to 5, I’m giving it a 4.6. Unsettling, trippy, and memorable, Us will stay with you for hours after you see it. I have no doubt that with time, it’ll be seen as one of the best horror films of 2019, and maybe the first great one of 2019 as well. Take a breath, jump in, and see the madness yourself. And while I still have your attention, I’m still looking for eARC readers for my novel Rose, about a young woman who starts turning into a plant creature (and that’s just the start of her problems). If you would like to get an advanced copy, all you have to do is send me an email at ramiungar@ramiungarthewriter.com. I only ask that you consider leaving a review on or after the release date. Thanks, and I look forward to hearing from you! *Fun fact: rabbits are capable of a much wider range of beneficial mutations when they reproduce that cousins or even siblings can mate with each other and still produce a healthy and genetically diverse brood. Take that how you will, but I have thoughts on how that plays into the film.